Happiness is a hot cup of tea and four legged friends. We've paired this elegant Tea Time fabric with Turquoise, but be sure to check out our Medium Blue/Fuschia and Fuschia/Pink Solid Combinations. For bolder pairings, consider our Heart Strings and Fuschia/Lime Fleece Collections for more stylish matching accessories. 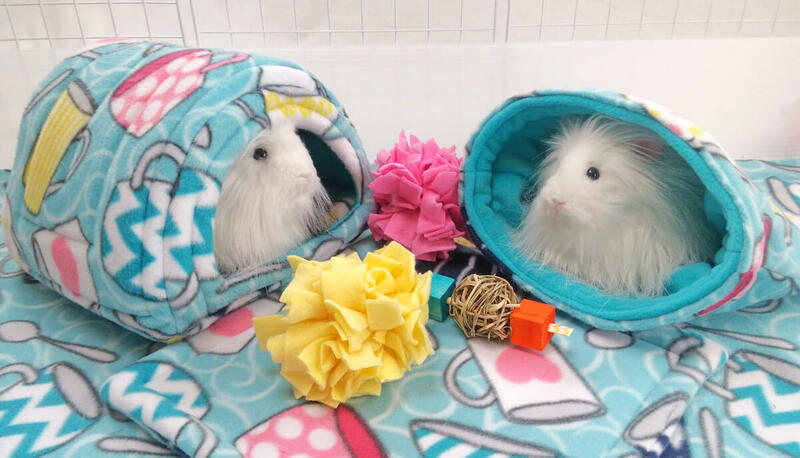 We typically only show the one Cage Liner (2x3), the Single Fleece Flipper and Case in our Collection, but all types, sizes and quantities of Cagetopia Cage Liners, Fleece Flipper sets and Fleece Flipper Cases are available in this fabric. We don't always have photos right away of all of the products that we carry in all of the fabrics that we stock. If it's shown here, it is available to purchase in this fabric.